Bitrate Configuration is a useful tool for managing the file size and export quality of your Highlight Reel. This gives you more control over compression and allows you to maintain space on your GNARBOX and devices. In addition, you may have received errors in previous app versions if you tried to export too large of a Highlight Reel. Bitrate Configuration is here to the rescue to help negate this issue and support your compression needs! Whether you're creating a large Highlight Reel or trying to compress your video for a social platform, this feature can make it possible to export to your phone and upload successfully. Next, select the bitrate you'd like to export your Highlight Reel and trimmed clips at. If you're not sure which bitrate to choose, check out the rest of this article for more information! GNARBOX will then export your next Highlight Reel or trimmed clip at the selected bitrate! It's import to remember to select your bitrate before you export your video from the Highlight Reel. What is bitrate & how does it affect my video file? Bitrate directly affects your file in 2 key ways: file size and quality. We've all witnessed a poor broadcast or watched a low quality YouTube video. The reason this occurs is due to poor bitrate compression. There are several different variables that can also affect what bitrate you should use. This includes resolution, frame rate, codec and even movement in your video. We'll talk more in a second how each of those affects the quality of your video. Notice how the low bitrate appears to be blocky while the high bitrate produces a sharper image. In this example, you can especially see this in the sky. GNARBOX uses a Constant Bitrate (CBR) versus a Variable Bitrate (VBR), which means you choose one bitrate option that affects the entire video on export. To date, the default has been 65Mbps but after Release 1.4.0 it is 45Mbps. Resolution is definitely one of the determining factors in choosing which bitrate you use to export your video. A high resolution video exported at 10Mbps will show more compression than a lower resolution video exported at 10Mbps. There is more information stored in the high resolution video and therefore, more data that is being compressed on export. 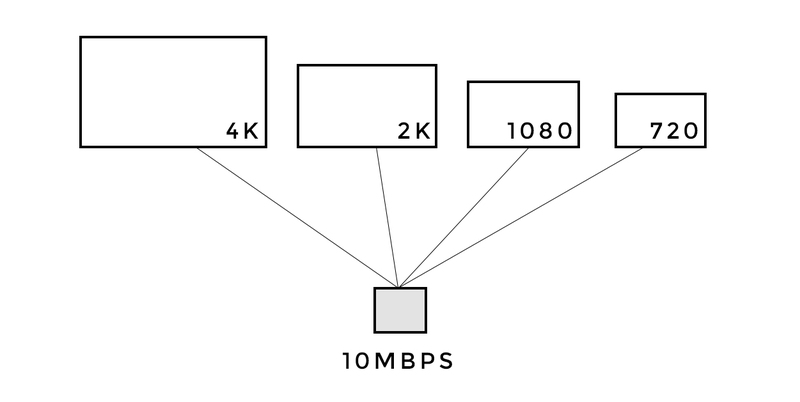 In the diagram above, you can see how the information in a 4K video is much greater than a 720p video and thus making the compression quality of the 4K video much lower than the 720p video. Similar to resolution, frame rate and codec have a direct correlation to bitrate and file size. More frames per second results in a greater amount of information in a video file. The more information your file contains, the higher the bitrate you will need to use when exporting. Codec has the same affect: a better or newer codec will result in a greater amount of information, thus requiring a higher bitrate on export for better quality video. If you've ever watched a sporting event or a concert, you may have noticed that a large amount of fast moment can cause a video to appear blocky. This can be a result of low bitrate. If your video contains a large amount of movement, we definitely recommend opting for a higher bitrate to reduce poor compression. For a great visual representation of this, check out this YouTube video. GNARBOX is currently formatted as a FAT32 drive, which limits exports to 4GB or less. Lowering your bitrate will enable you to export a longer Highlight Reel. The chart below will show you the maximum Highlight Reel length you can export at each bitrate setting. So although you can export an 8min video at 65mbps, you can also export a 44min video at 10mbps. The important thing to note here is that there will be a significant quality difference between 65mbps and 10mbps. Which Bitrate Should You Choose? If your video is long, you many need to go below these suggestions or export your file at a lower resolution in order to keep your file below the 4GB limit. Instagram automatically does quite a bit of down-compression to a story on upload. Based on our tests, 30Mbps exports at any resolution seem to perform at the highest quality for Instagram Stories.